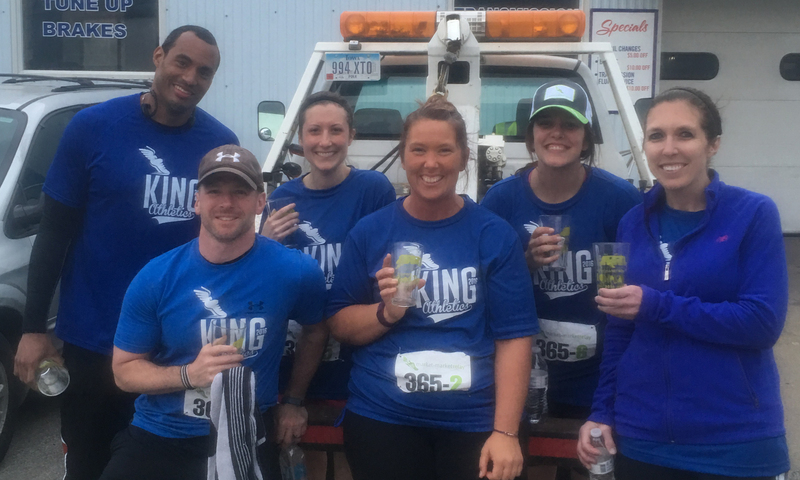 This story is the first part in a three-part series about our three 2017 Market to Market Relay Iowa Spotlight Teams. Suddenly, a first time Market to Market Relay team watched as their tire flew off their van. It was a mishap every team dreads on race day. “Since the tire just flew off, we thought maybe we could just put it back on,” said team captain Lori Staples. The team realized this wasn’t possible when they saw the missing lug nuts. Two teams behind them stopped to make sure everyone was okay and even let Staples’s runners hitch a ride to the following two exchange points. Throughout their van’s breakdown, Staples’s team never stopped running. While in full contact with the Market to Market Relay race director, the team never even had to take a time delay. “People would stop and say ‘we totally drove by you and figured you were out for the day’ but we never missed an exchange,” Staples said. They eventually ended up altogether after Staples’ father-in-law came to the rescue with a new van at Exchange Point 4. The team’s 2017 name was a running joke during the race, but it wasn’t too hard to land on something to do with the most memorable part of their day. Good luck running (and driving) Saturday, ‘No Lug Nuts, No Problem’!